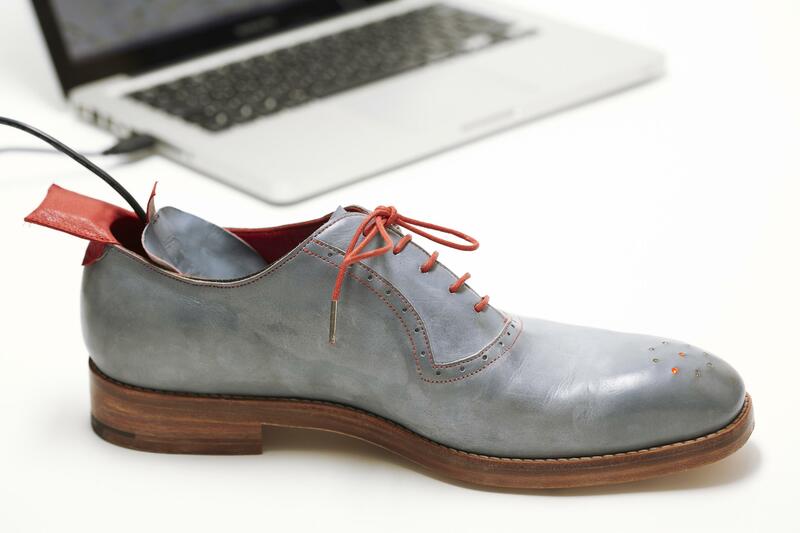 After uploading a destination to the shoes via a laptop and USB cable, a GPS sensor embedded within the left shoe is activated by a heel click. 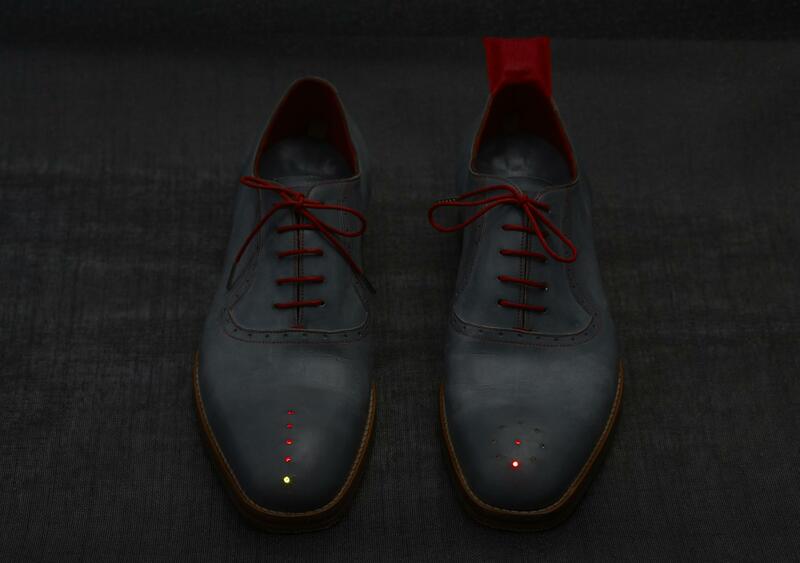 A circle of brogue perforations reveal LEDs that light up to indicate which direction the wearer should take. 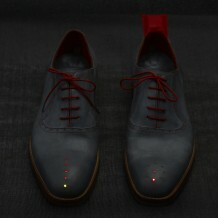 The right shoe indicates distance travelled, with a progress bar of red LED lights that illuminate as the wearer gets closer to their target. 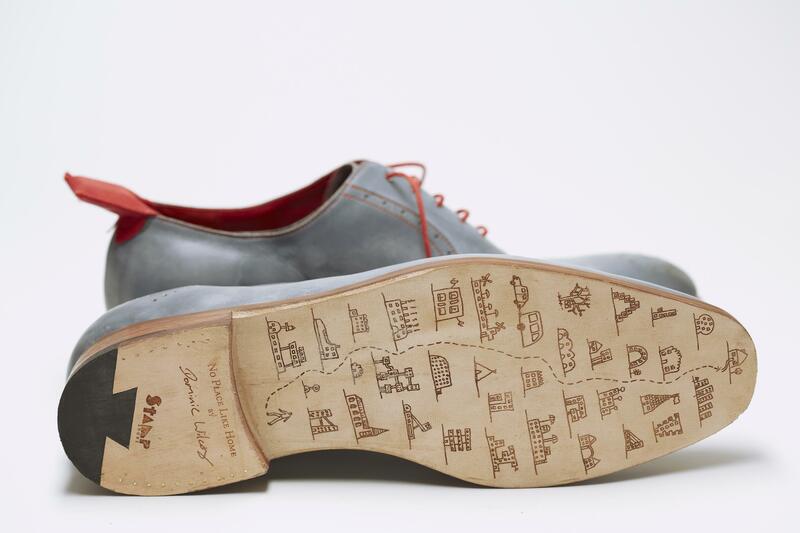 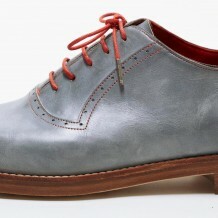 Wilcox’s signature cartoon style adorns the leather soles of the shoes. 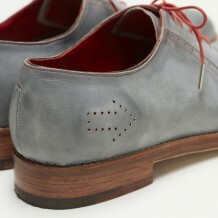 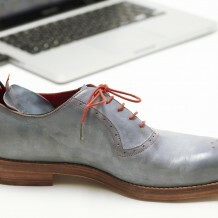 The shoes were inspired by Dorothy’s ruby slippers in The Wizard of Oz and made to Wilcox’s specific design by Northampton-based traditional English shoemaker Nicholas Cooper of Stamp Shoes. 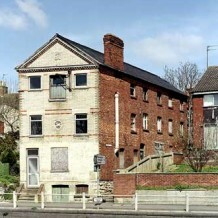 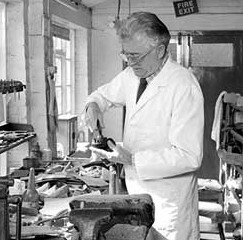 Nicholas is among the last of a generation of shoemakers who trained at the old footwear college in Wellingborough. 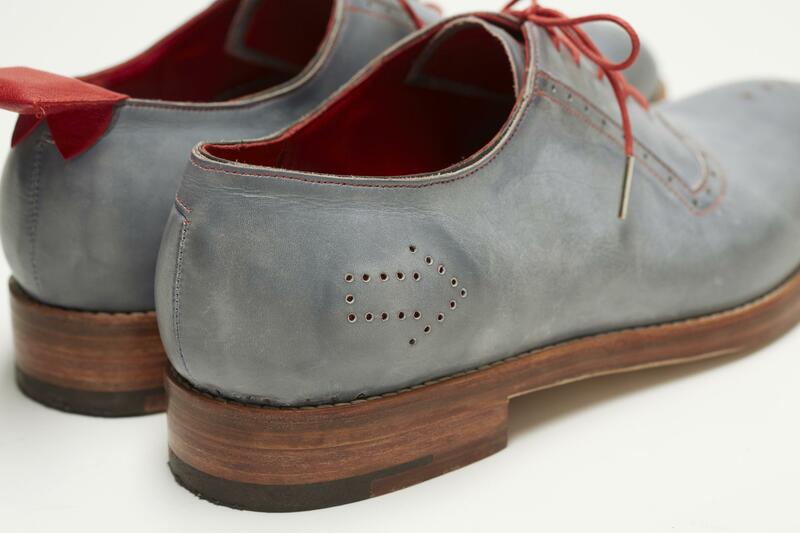 Learning from the hands of master craftsmen, he has continued to perfect his skills within the historic and world renowned boot and shoe industry of Northamptonshire where he went on to create Stamp Shoes. 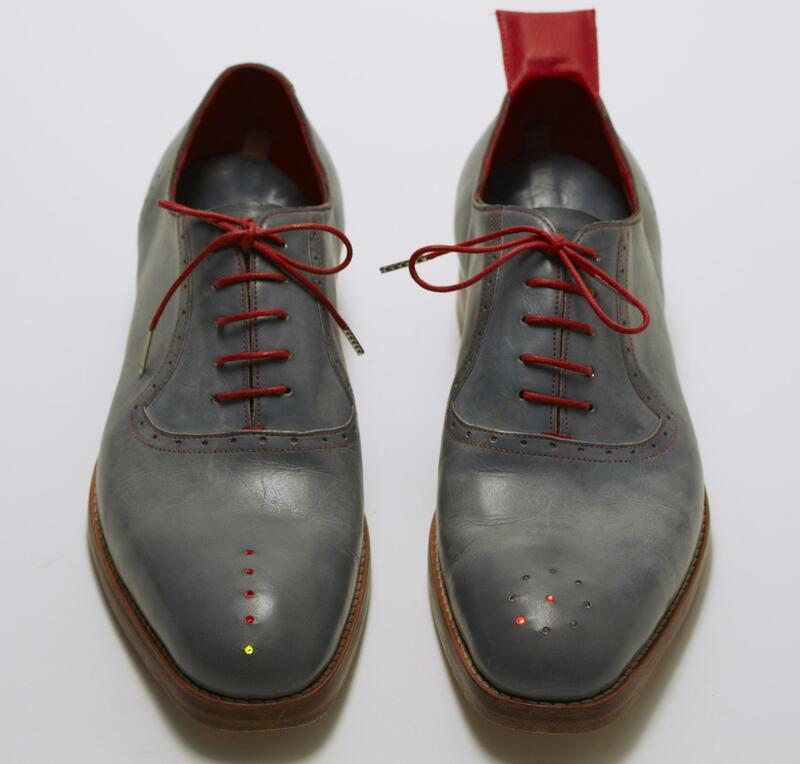 To date the shoes have been exhibited at KK Outlet, Hoxton as part of the London Design Festival, Northampton Museum and Art Gallery, 8th Annual WIRED Store in New York and Invisible Design exhibition during Milan Design Week. 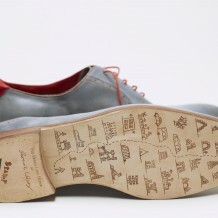 The shoes will be exhibited later this year at the Northern Design Festival to be held at the National Glass Centre, Sunderland.